President Barack Obama entered office in 2009 with a strong vision for improving the nation’s education system to advance all children’s opportunity and success. That vision included efforts to improve student achievement and raise graduation rates; make education more equitable; support high-quality instruction; ensure all students achieve to high standards that prepare them for college and careers; enhance the quality of assessments; spur innovation and systemic, state-level improvement; and increase investment in what works. That vision was supported by significant increases in funding for Title I, which supports students disadvantaged by poverty. Today, the country can demonstrate significant progress for students through the Obama Administration’s comprehensive vision for elementary and secondary education. This progress is due, in large part, to the hard work of teachers, principals, state and local leaders, communities, parents, and students. For example, in 2009, about 3 million young people between the ages of 16 and 24 had dropped out of high school; by 2014, that number had fallen by 17 percent to 2.5 million. The nation’s graduation rate is at its highest point ever — at 82 percent. Especially encouraging is that more historically underserved students, including low-income students, English learners, and students with disabilities, are graduating from high school and going to college. In fact, the progress of black and Hispanic students since 2011 has outpaced the growth of all other students. Over the course of the Obama Administration, the number of high school “dropout factories” — schools that graduate fewer than 60 percent of students on time — dropped sharply. 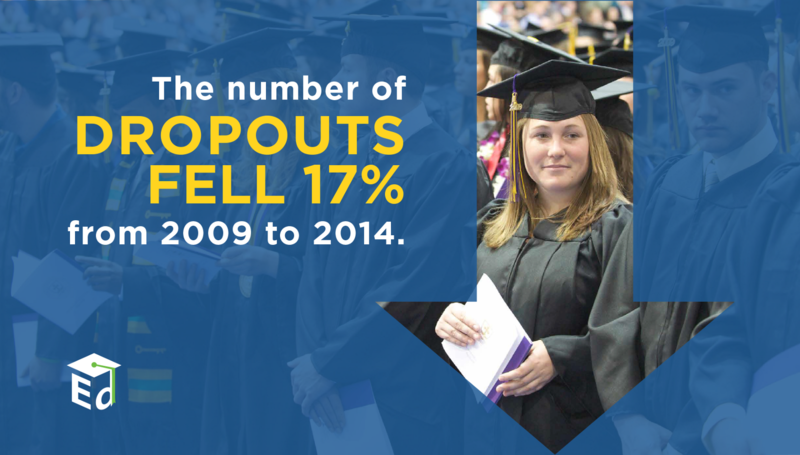 In 2008 there were approximately 1,800 of these schools, accounting for a significant number of our nation’s dropouts. In 2014, that number had fallen 42 percent to 1,040. Positive changes in our elementary and secondary schools were accelerated by the Obama Administration’s emphasis on turning around America’s lowest-performing schools. Since 2009, states have built education accountability systems specifically designed to direct the greatest supports to schools that struggle the most. States engaged in this work with the help of the Obama Administration’s signature $4.35 billion Race to the Top grant program and flexibility from No Child Left Behind’s one-size-fits-all approach to improving education. 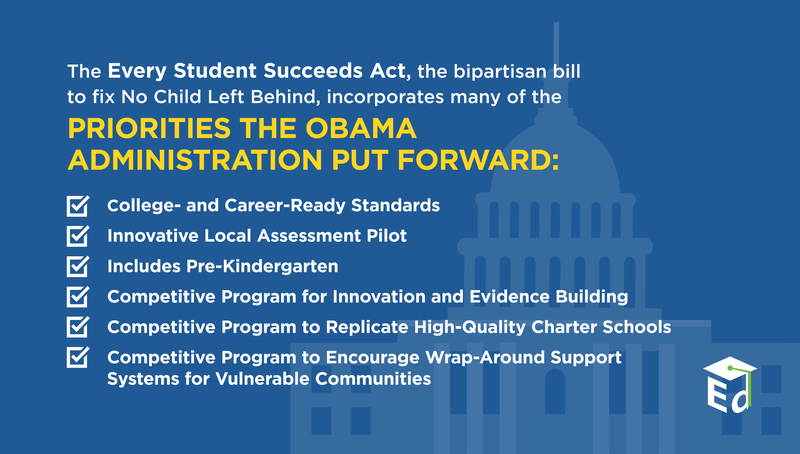 The President also pushed Congress to reform No Child Left Behind. In the absence of Congressional action, between 2011 and 2015, 42 states, the District of Columbia and Puerto Rico applied for and received flexibility to implement unique, state-devised plans to bring about systemic changes and improve low-achieving schools. Without this flexibility, these states would have continued to be bound by the unrealistic and unworkable timeline for reaching 100 percent student proficiency under No Child Left Behind, which required states and districts to implement one of several federally approved interventions in every school identified for improvement, with little regard to schools’ individual needs and challenges. States also received critical resources in their school turnaround work through the U.S. Department of Education’s School Improvement Grants (SIG) program. 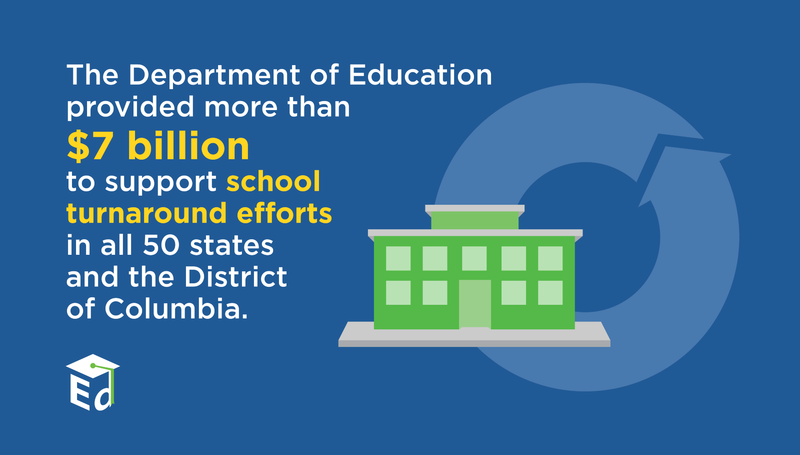 The Department provided more than $7 billion to support turnaround efforts in all 50 states and the District of Columbia, and many schools receiving that support have seen significant gains. Nearly 40 percent of schools in the first cohort saw double-digit gains in students’ math achievement and about 30 percent achieved double-digit improvements in reading achievement. The average graduation rate in the high schools in the first cohort outpaced the national average. Schools in cohorts two and three also made significant progress. President Obama made a call early in his presidency for world-class standards for every student in every school, and today, nearly every state has raised its academic standards. Understanding that schools are only as strong as the expectations they hold for their students, the President called on states to adopt academic standards that would prepare students for success in college and careers. The Obama Administration encouraged states’ voluntary adoption of rigorous standards through its first Race to the Top grant competition in 2009 as well as through waivers from the requirements of No Child Left Behind. Race to the Top also provided $350 million to two consortia of states to develop state-of-the-art assessments suitable for measuring deeper learning. By 2016, 45 states and the District of Columbia have adopted and are implementing college- and career-ready standards and improved assessments aligned with those state-selected standards. Those states serve more than 24 million students, approximately 4 million black students, 3.5 million Hispanic students, 2.8 million students with disabilities, and 1.5 million English learners. 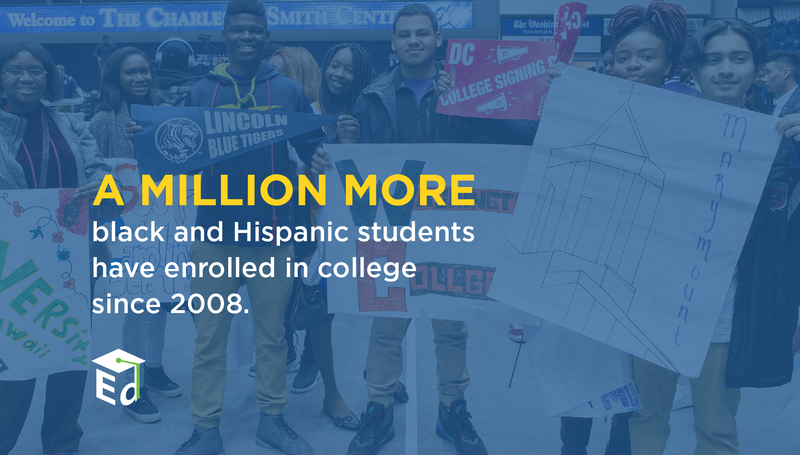 In addition, more students of color are graduating from high school ready to succeed in college. In 2015, the President also released his Testing Action Plan to protect the vital role that good assessments play in guiding the growth and development of students while also protecting instructional time. The plan laid out principles for fewer, smarter assessments that must be high-quality, time-limited and fair; fully transparent to student and parents; and just one of multiple measures of student achievement tied to a broader strategy to improve teaching and learning. The Obama Administration also supported state efforts to develop and implement high-quality assessments through both the Grants for State Assessments and the Enhanced Assessment Grant programs. Beginning in 2015, the Department of Education provided funding to states to help educators, administrators, and policymakers develop state-of-the art tests and improve state assessment systems through activities like improved scoring and reporting, as well as auditing existing state assessments to root out low-quality or redundant tests and reduce burdens of testing on students and teachers. The Administration’s support of high standards and better assessments will have lasting, positive effects on the nation’s schools and classrooms into the future. The Obama Administration’s robust support of evidence-based innovation gives states and school districts tools to direct their education improvement efforts toward the most effective practices. With a focus on new and promising efforts backed by research, the Administration helped schools and communities create supports, partnerships, and programs to help educators tackle persistent challenges, accelerate achievement for all children and youths, and target interventions for students who were historically underserved and most vulnerable. The Race to the Top fund was specifically designed to support innovation and bring about systemic, state-level changes. 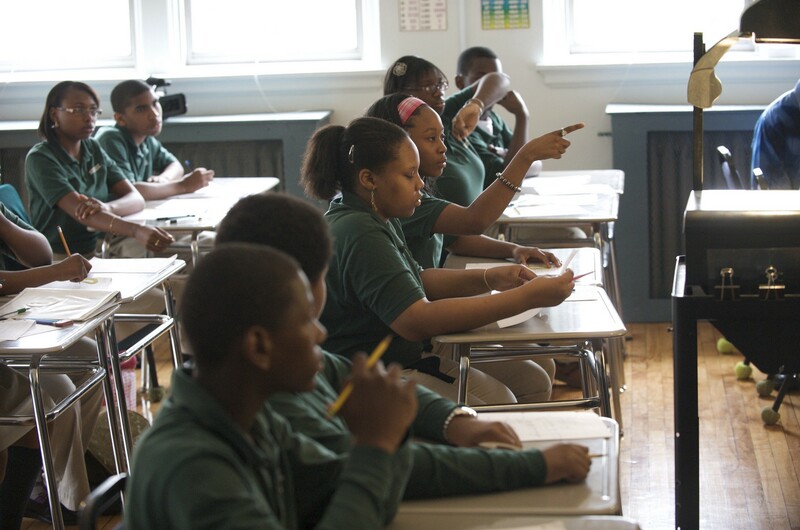 Another initiative invested over $400 million in replicating and expanding high-quality charter management organizations that are transforming our students’ academic trajectories, especially in urban, high-poverty areas. A first-of-its-kind program, Investing in Innovation (i3), also was born out of this presidential priority for increased innovation in education. As part of i3, projects were required to undergo a rigorous, independent evaluation and to share the results publicly, helping to identify strategies that enable students to excel and that educators can adopt or adapt. This work is expanding the knowledge base that the education field can use to help students make even greater progress in the years ahead. Much of the vision President Obama outlined for education improvement since 2009 has been codified in the nation’s new education law, the Every Student Succeeds Act (ESSA). The President’s blueprint for rewriting and replacing No Child Left Behind, issued in 2010, and his Administration’s flexibility agreements with states, which began in 2011, were major milestones on the road toward a new education law for the country. In 2015, the U.S. House of Representatives and the U.S. Senate advanced comprehensive reauthorizations of the Elementary and Secondary Education Act to replace No Child Left Behind, which led to the creation of ESSA — passed by substantial bipartisan majorities and signed by President Obama inDecember 2015. ESSA embraces many of the priorities and initiatives created or championed by the Obama Administration, such as college- and career-ready standards for every student; annual, statewide assessments that provide educators, parents, and communities with critical information on student progress; a commitment to ensuring more of our youngest learners have access to high-quality early learning opportunities; locally tailored systems for school improvement in states; and education innovation through a successor to this Administration’s i3 program. Additionally, ESSA advances equity by upholding critical protections and maintaining dedicated resources for America’s most disadvantaged students. The law requires that action will be taken to improve outcomes for students in schools that chronically underperform, that do not improve low graduation rates, and that do not ensure progress for all student groups. 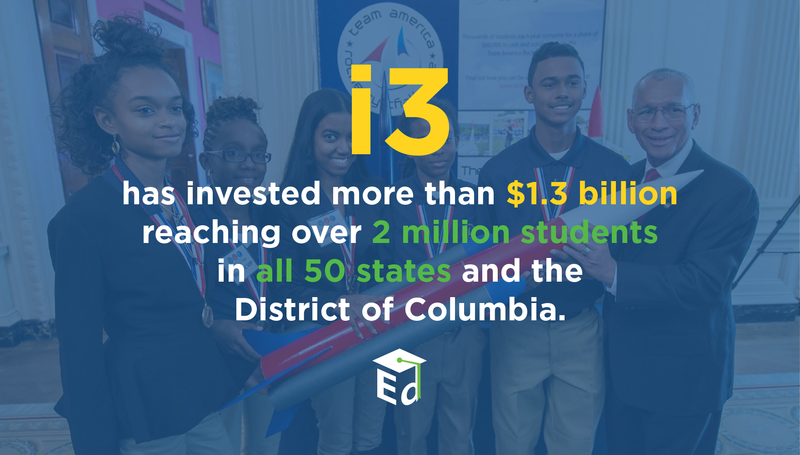 ESSA also creates opportunities for states to reclaim the goal of a rigorous, well-rounded education for every child — an education that not only includes math and reading but also provides all students with access to subjects such as science, social studies, world languages, the arts, physical education, health, and other key areas of study. Importantly, the new education law provides the chance to build on the progress made during the Obama Administration, and to ensure that all children receive an education that expands their opportunities and helps them to achieve their dreams. Much of the change ahead in education rests on the leadership of educators in schools across the country. What happens in classrooms and in schools will make the difference for students and will determine the nation’s prosperity and competitiveness. Let’s continue the work to deliver the promise of a world-class education to every child.